this machine price minimum Rs. 4 lakhs and above , This machine is used to assembly the shox absorbers parts , like spring , nut and eyelet in the piston rod by compressing the spring and by using the nut runners. We are the leading manufacturer of Assembly Stations. We manufacture the quality and durable Industrial Assembly Stations for commercial purpose only. Owing to the wide experience of this domain, we are instrumental in manufacturing Assembling Machine. This Assembling Machine has optimum performance. Our Assembly Lines are built using suitable components. Our knowledge in the field of pneumatics, PLCs, SCADA, electrical control components, hydraulics and the like facilitates us converting customer requirement into efficient and reliable assembly lines. Catering to the requirements of our clients, we are involved in offering Component Assembly Machine. Typically automates manual processes and delivers INCREASED – production throughput, reduce rejections, achieve consistent/verifiable quality and relieving skilled manpower for higher level jobs. Feeder line assembly machine is designed to assemble the child parts. It is classified into four different stations like Key bracket assembly, outside & Inside release lever assembly and Self cancel lever assembly. Key bracket assembly is done by hydro pneumatic press and remaining is done through orbital riveting machine. 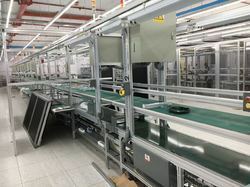 line Automation With Inter Connectivity Between The Cells For Progressive Machining through Peripherals Like Conveyors , Transfer Chutes, Air Drying Stations And Online Gauge Inspections.